Once upon a time, Nippon Ichi Software released a beautiful storybook style game for the Japanese market. 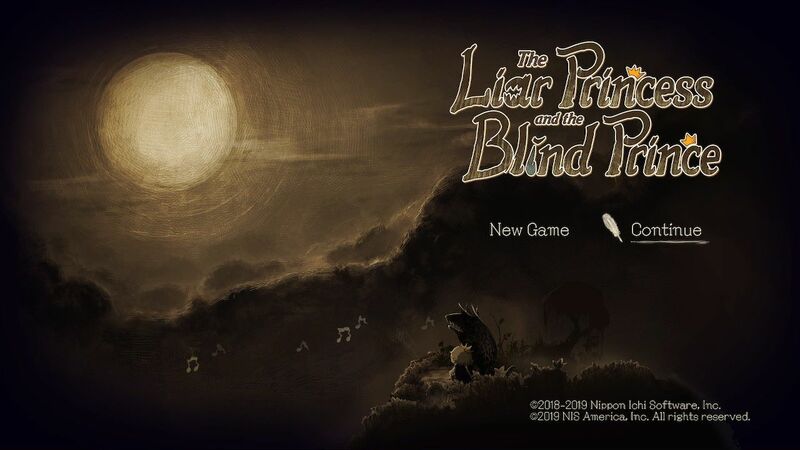 That game was The Liar Princess and the Blind Prince, which hit the Switch, PlayStation 4 and PlayStation Vita back in May of 2018. Fast forward to February of 2019, and the game is finally gracing our Switches in the West. “This is a tiny tale of a love in a faraway land.” The games opening line sets up the style of this story perfectly. Narrated in a somber Japanese voice, The Liar Princess and the Blind Prince delivers its story like an ancient fairytale. The game is seemingly plucked straight from the pages of an old book, though I will go into more detail on the visual style later. This tale begins in a time where monsters roamed the woods, and humans feared those monsters. That said, every night a beautiful singing voice can be heard through the woods. One of those that heard this voice was a prince, and one day he went into the woods to hear that beautiful song. The voice belonged to a wolf, and once her song finished she heard an unfamiliar sound. The sound was that of applause. The prince sat at the bottom of a hill clapping at the beautiful song he had just heard. The wolf thought the boy to be stupid, and considered partaking in a midnight snack. She was rather fond of the applause though, and let the boy be. One day the prince wanted to see whom the voice belonged to, and the wolf, in an attempt to cover his eyes in fear that if he knew she was a monster that he would stop coming to listen to her song, accidentally scratched out his eyes. From here, the wolf visits the boy, wanting to take him to the witch deep in the woods to fix his eyes. Knowing that if she held his hand as a wolf, he would know she was the monster that scratched out his eyes, so the wolf visited the witch before bringing the prince there. It is here that she gained the ability to transform into a princess at will, and thus our journey begins. The story is beautifully told, and is the driving force behind this game more than the gameplay itself. It is a tale of love, trust, honesty and betrayal. Not only is the story strong, but the way it is told is phenomenal, adding emotional weight to the whole tale. Setting this up as a fairy tale, whilst pairing it with the visual style of an ancient storybook was a stroke of genius. Speaking of the visual style, it is an absolutely gorgeous game. It uses a lot of dark tones, which matches the somber story perfectly. Each scene is transitioned by a page turn, and each character, the environments and the cut-scenes are all hand drawn. Everything to do with this game visually is in service of this fairy tale motif, and in that this game succeeds spectacularly. As mentioned previously, the narration is done in a somber voice exclusively in Japanese. The voice over work of the narrator is tremendous, and really adds to the dark nature of this tale. Musically the game sounds pleasant, with few tracks, but each one suiting the art style perfectly. As for sound effects, there are very little used here, and none really stand out, nor hinder the enjoyment of the game. The Liar Princess and the Blind Prince is a side-scrolling puzzle platformer. You start at the left of the level, and progress through the stage until you hit the end at the right of the level. There are enemies to slay and puzzles to solve to allow you to continue on. The catch is, that you must always guide the Blind Prince along with you. The controls are simple. You hold Y to hold the prince’s hand to guide him where to go. B allows you to jump, while X transforms you between your wolf and princess forms. As the wolf, you are somewhat invulnerable, besides falling down death pits. You can also use your claws to destroy enemies and objects. As the princess, you can hold the prince’s hand to guide him, as well as use levers and interact with more puzzles, though you can also die in this form. Eventually, you gain the ability to give the prince orders, allowing you to get the prince to engage buttons or pick up objects to help solve puzzles. This allows some puzzles to require you to guide the prince on a completely different path to the one you are taking. I found the majority of the puzzles fun and clever. It never gets too hard, and there is always a skip feature that allows ones that are over your head to be bypassed. That said, there was one puzzle that did my head in. It was completely optional, but I was determined to work it out. After doing so, the game made me feel like a genius. That is a rare feat in a video game, and sadly one that only happened once in this game. Besides that one difficult puzzle, the game doesn’t continue with that theme, as it instead goes back to a linear experience. As good as the puzzles are throughout the game, the end level finishes things on a bit of a low note in that regard. Gone are the thought provoking puzzles, instead replaced with more “trial and error” style puzzles. Basically, you will need to die a few times to work out exactly how to tackle every aspect of a bunch of the last puzzles, and having to restart after a death is more of a chore than anything when you aren’t given the time to figure things out on your first try. This means repeating whole sections of a puzzle you know the solution too, and that is never fun. There are some finicky control aspects as well. The control you get in the air is rather floaty, which doesn’t feel great for some of the more precise platforming sections. Luckily there aren’t many of those, though there are some that require you to do them while holding the prince’s hand. I found some platforms that launch you can not activate for the prince, sending you flying whilst leaving the prince behind. Occasionally it can happen the other way, and without you controlling the landing it usually ends with the prince dying from fall damage. There were also two puzzles that completely locked me out, requiring a restart of the level I was on. The Liar Princess and the Blind Prince is an artistic marvel, that concentrates more on the story and its artistic merit than it does as a video game. That may sound derogatory, but that is far from my words meaning. The way this story is told, the character interactions, the presentation, everything about this game is an experience. As far as the gameplay goes, the puzzle solving aspects are spectacular for the most part, and barring a few control issues, bugged puzzles and the last level becoming a trial and error based chore, the game was well worth the experience overall.